What’s life without simple pleasures? Create an outdoor living space ideal for hanging out, entertaining family and friends, enjoying the warm weather. Transform your patio, deck, backyard, or poolside into a stylish and relaxing spot with comfortable and functional seating. But with tons of outdoor chairs in the market, it could be a tad intimidating to choose the perfect one for your space. In this article, we round up some of the best pool chairs to help you pick the right one for your homes. 2.1 What are the factors to consider in choosing the perfect outdoor chair? This pool chair reviews will give you a thorough information on the products and the benefits of each one. If you’re looking for a traditional but stylish and affordable lounge chair, you may want to consider this wicker chaise lounge from Darby Home Co. This product can last a long time since it is made of woven resin wicker while the interior frames are made of iron. It can support a maximum weight of 250 lbs. You can keep it outdoors year-round as it is weather resistant. This chair is also heat resistant so it will not get hot to the touch under the sun. The back can be laid completely flat or adjusted into 5 reclining configurations to give you the most comfortable position. It is fully assembled except for the armrests that can be attached easily. Cushions are not available but people who already purchased this item claimed that it is comfortable enough even without the paddings. This chaise lounge by Wade Logan will give your outdoor space a contemporary feel at an affordable price. You can choose among the 3 available colors; white, grey, or brown. The lounger is sturdy enough since it is made of 100% high-quality resin and polypropylene. It is heavy-duty as it can support a maximum weight capacity of about 300 lbs. The frame is imprinted with wicker woven pattern that gives the chair a nice appearance. The headrest can be adjusted into 4 positions or laid completely flat, which is great for lounging under the sun. Since the product is entirely made of plastic, it will not rust when place next to the pool or left under the elements. This chair can be folded and stacked so storing them during winter months will be a breeze. Some buyers noted that it is not very comfortable to sit on without a cushion but since the item is of standard size, you can purchase any cushion from another brand. 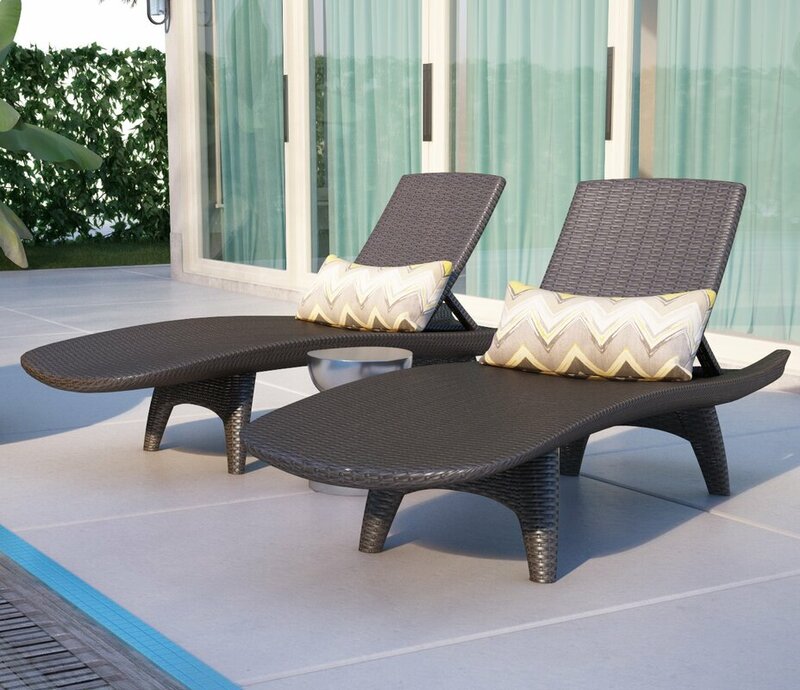 Mercury Row delivers an elegant outdoor lounger with their Belton Chaise Lounge with Cushion. 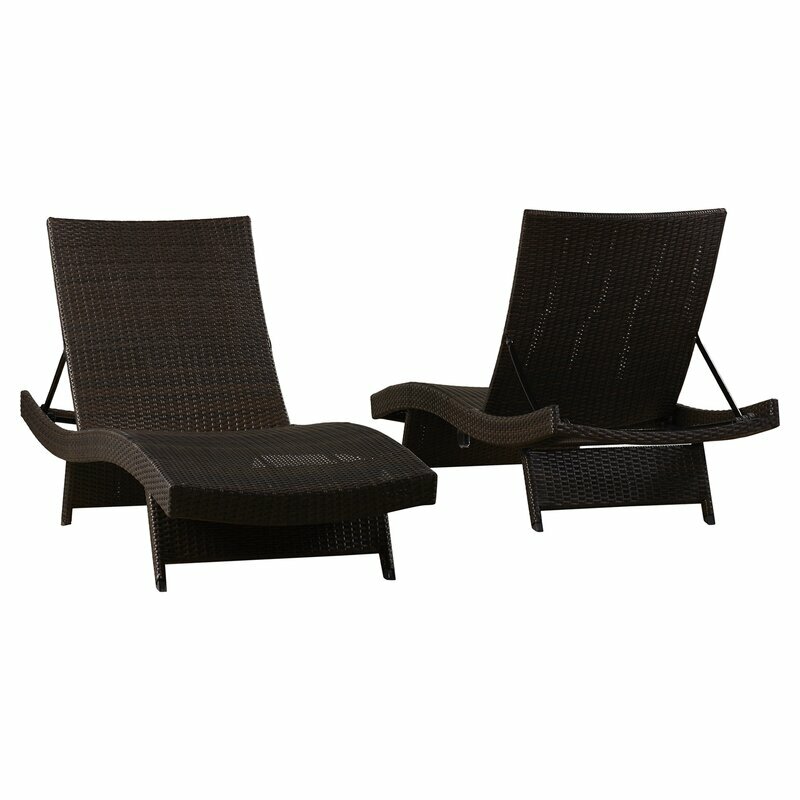 The wicker lounge chair comes with detachable cushions for a comfortable yet stylish sitting. The inner frame is made of stainless steel so it will not rust even if the chair is left outdoors. It is sturdy too since it can support 250 pounds of weight. The cushions are filled with thick and firm foam and their covers are removable for easy cleaning. One negative feedback though is that these cushions are not moisture proof so it would be better to take them inside the house when it rains or snows. The chair has 6 reclining positions so you can sit comfortably and it can also lay fully flat if you want to lie on your stomach. The lounger can also be used without the cushions but some customers think that it is quite low to the ground. 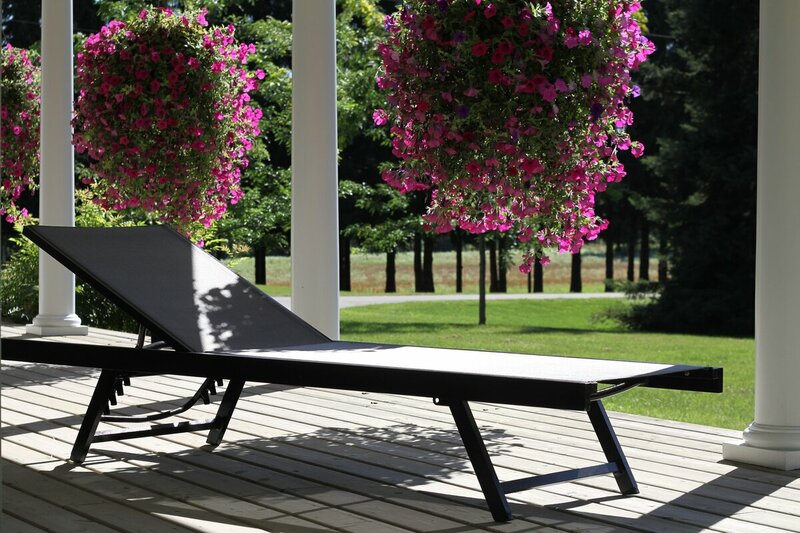 The stylish reclining chaise lounge from Brayden Studio is a great piece of furniture for your backyard or poolside. It comes in 3 different finish; grey, brown, and mixed mocha. This product gives off a modern vibe with its curve silhouette and slanted legs. 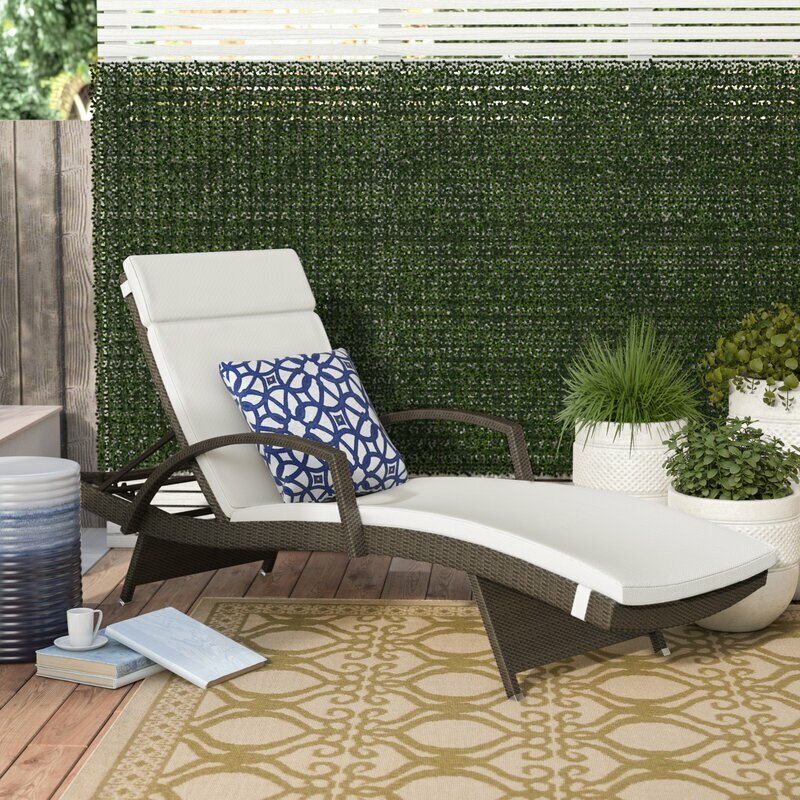 Made of high-quality iron and wrapped in woven wicker/rattan, this chaise lounge is UV protected and weather-resistant so it can withstand extreme outdoor conditions. The color does not fade over time. It is not rust resistant though so it needs to be dried immediately if soaked in water. The chair is adjustable for maximum comfort. You can recline it into 5 angles, adjust it to a fully upright position or lie down completely flat. The gray and brown finish has a weight capacity of 300 lbs each but I prefer the mixed mocha finish because it can support 330 lbs of weight and it will be easy to store since it only weighs about 21 lbs. Create a stylish and relaxed outdoor seating with this reclining chaise lounge from Three Posts. This wicker lounge comes with colored cushions that will surely add a dash of spice to your outdoor space. The frame is made out of iron coated with anti-rust and wrapped with brown woven resin wicker, making the chair safe from the elements. Another great feature is the armrests because they add coziness to the lounger. Also, it can be reclined into 5 positions, or you can choose to sit up or lie fully flat. The detachable cushions are filled with foam and furnished in weather-resistant polyester blend fabrics. The cushion covers are available in 9 different colors so you’ll have a lot of choices and are machine washable for easy cleaning. The zero-gravity chaise lounge is fashioned to mimic the weightlessness astronauts go through in space. This lounge chair from Zipcode Design is easy to maneuver and is ideal for small areas. The cord supports are designed to be elastic that allows the woven mesh fabric to adapt to your body and provide you with full comfort. Another good feature is the knobs that easily adjust the seat to the desired angle and safely lock the chair in any position. The armrests are styled in a curved shape to further allow better support and comfort. Also, the detachable head cushion helps reduces back pressure. The chaise lounge comes with a removable mini tray that can hold your phones or wine glasses. It is also available in 8 different finishes so you can choose one that complements your space. This lounger is highly recommended by reflexologists and therapists as it induces their patients to go into a tranquil state. 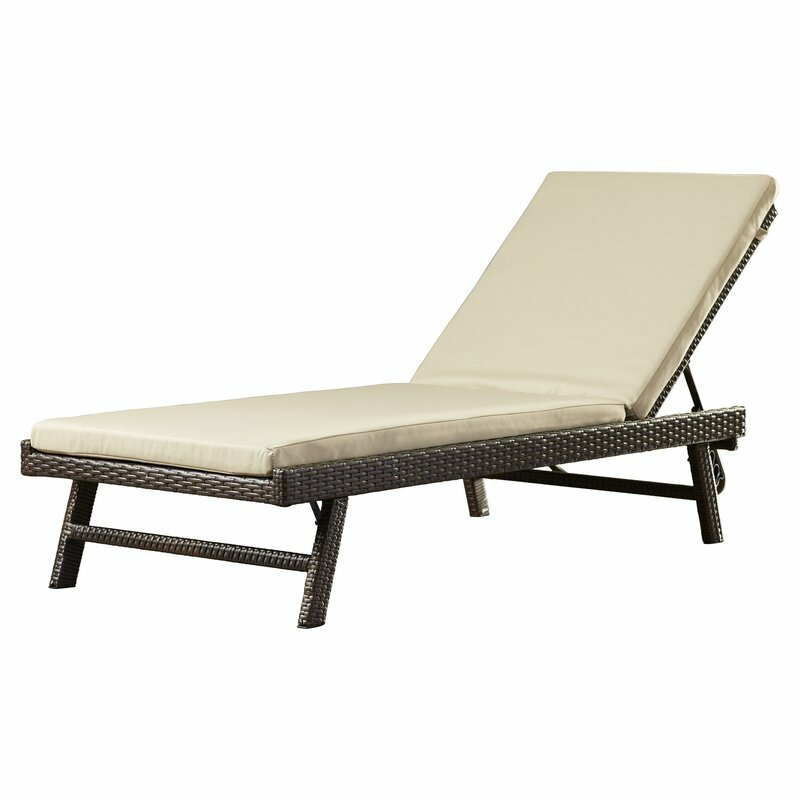 Inject a touch of coziness to your patio with a Calypso Chaise Lounge from Beachcrest Home. The chaise lounge is constructed of sturdy iron support and features a brown-finished solid wicker frame that provides maximum comfort with or without a cushion. It includes a tan, all-weather cushions that are thick enough and super comfortable. The neutral color goes well with anything and doesn’t fade easily. This pool chair is longer than a regular lounger and its weight capacity is around 300 lbs, so it is good for tall and heavy people. The backrest can recline into 4 positions and lay completely flat so you can adjust it to the most comfortable position. This affordable lounge is already assembled so you can just set it up to your space. The cushions are not waterproof though so you may have to consider where to put it up. The Hanging Chaise Lounger from Freeport Park’s Maice Collection combines the classic hammock with modern design to provide you with the feeling of being afloat on clouds. The hanging lounger’s unique concept gives it an edge over other chaise lounges. The ergonomic, curved design of the lounge lets you sit on it for hours without having cramps. Also, the hammock stand allows you to swing freely and easily without toppling over. The polyester cushion and headrest are soft and comfortable. The armrests are padded to give your arms a comfy place to lean. 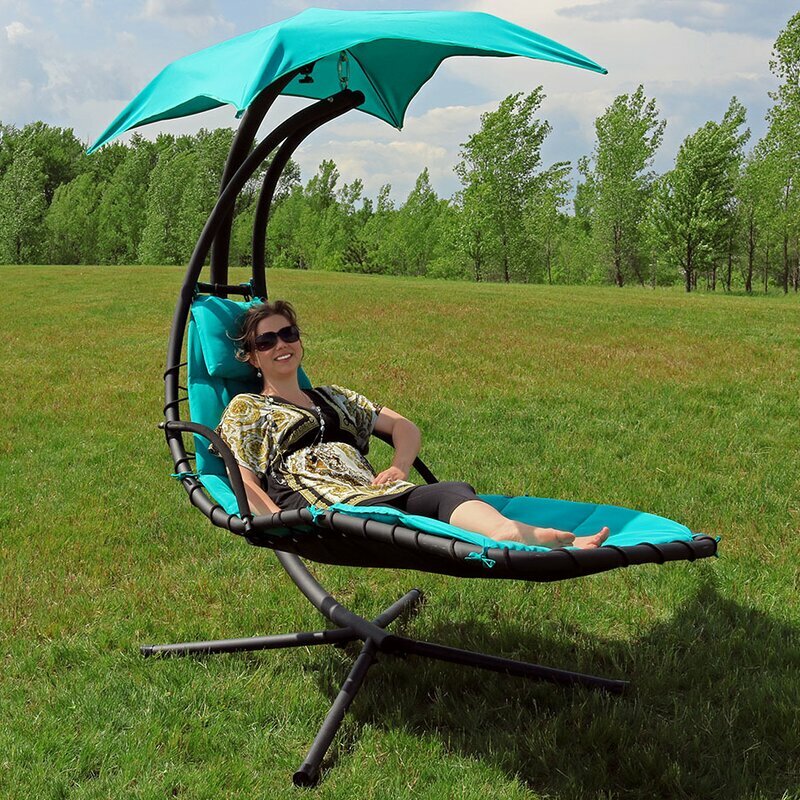 The chaise lounge also includes a removable canopy that will provide you with a good shade. This mobile outdoor lounge chair from Alcott Hill is a timeless piece that will add a touch of elegance to any alfresco setting. The iron metal frame is coated with an all-weather and water-resistant finish for a longer durability. The overall design and trimmings of this lounger give off a classic charm. The chair is comfortable even without a cushion, and even has wheels for easy transporting. The backrest can be adjusted into 5 reclining positions. The great advantage of this chaise lounge over other pool chairs is its weight capacity of about 500 lbs. Add that to a slightly longer and wider built, and you’ll have the best pool for everyone. The Argo Multi-Position Reclining Chaise Lounge created by Andover Mills is constructed of high-quality polymer material. Even though it is made of plastic, it looks polished and elegant. The frames are coated with white, semi-gloss finish so it is easy to clean. Also, weather-proofing and UV inhibitors are applied for long-lasting durability. The backrest is contoured for added comfort. It can be adjusted with the armrest into a comfortable position but it doesn’t lay flat. What sets this product apart from others is the drop-down footrest that gives you the option to lounge in a chair or keeps your feet up. Likewise, this lounger has wheels for mobility and folds easily for storage. This chaise lounge from Latitude Run is perfect for the modern and edgy individual that prefers simple yet practical things. Its neutral colors complement other outdoor décors. 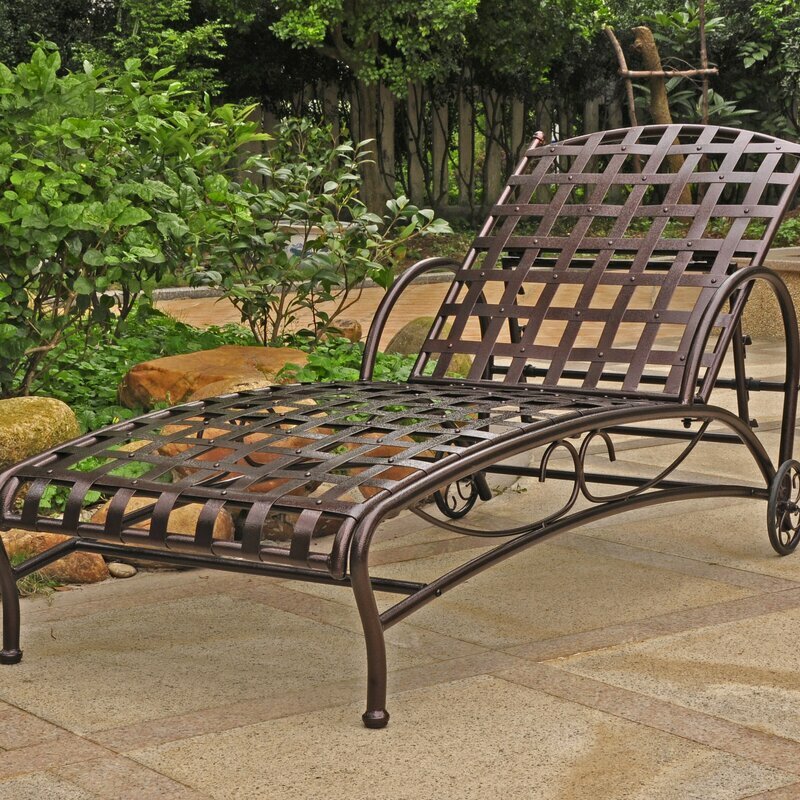 The frame is made of aluminum which means this lounger is lightweight and rust resistant. It is wrapped with easy-to-clean acrylic mesh that doesn’t absorb water and dries easily. Despite being lightweight, this pool chair is heavy-duty and can accommodate up to 330 lbs of weight. The backrest can recline into 4 settings and can lay completely flat. A cushion is not needed since the chair is a sling seat for maximum comfort. 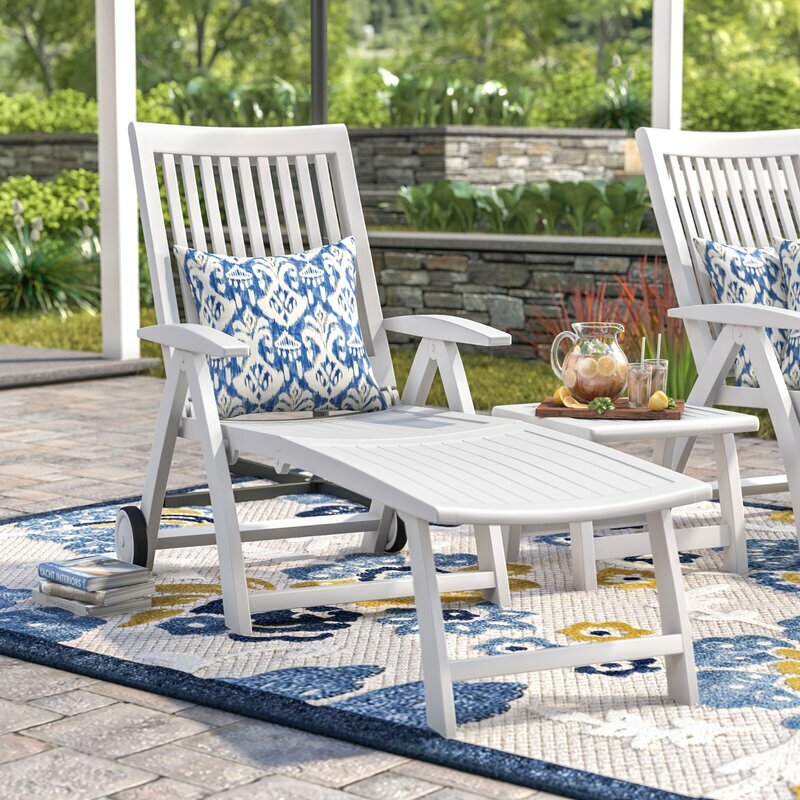 The Island Breeze Sling Chaise Lounge set by Panama Jack Outdoor combines comfort and style. This set comes with 2 stackable chaise lounges and an end table designed for an effortless island-style living. The chaise lounges are made of rust-resistant and rust-proof aluminum coated with Espresso finish while the table top is made up of waterproof slatted aluminum. The set is intended to withstand extreme weather conditions. The exclusive Phifer sling seat eliminates the needs for cushions. It can be adjusted to different configurations but it doesn’t sit upright unlike the regular pool chairs. The chairs are longer than the usual so there’s extra legroom. It’s light enough to transfer around yet heavy enough not to topple over when hit with sudden wind gusts. An outdoor space is only as comfortable as its outdoor décors. 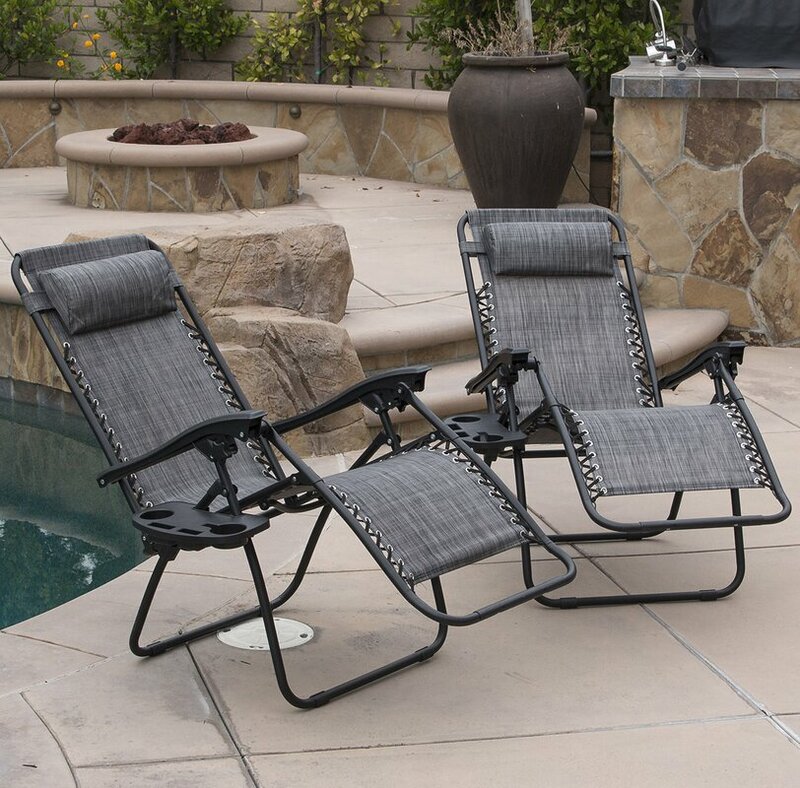 Whether you’d like to hang out, entertain family and friends, or enjoy the warm temperature, you’ll need a comfortable pool chair to lounge on. What are the factors to consider in choosing the perfect outdoor chair? Apart from durability, comfort, style, and, of course, price, we think the most important factor to consider in choosing any outdoor furniture, especially the chairs, is their endurance to weather. Different weather conditions can compromise the appearance, and most especially the structural integrity of the furniture. Single or Whole Sets (Many stores offer great deals when you buy furniture in set). We listed 10 of the most common questions frequently asked by our customers. Does the item need to be assembled? Is the item weather resistant? Is the item water resistant? Is the item heat/UV resistant? Is the item rust resistant? What materials are used for this item? Is the product worth it of its value? In this review, the Schilling Chaise Lounge from Alcott Hill is our top choice as the best pool chairs. We love the elegance and the overall design of this chaise lounge. We also like the fact that it has wheels for easy mobility. And lastly, its weight capacity of 500 pounds can accommodate the majority of people. In choosing the best furniture, it’s best to consider the cohesion and functionality of all the elements. This will intensify the enjoyment you’ll get from your outdoor living space.